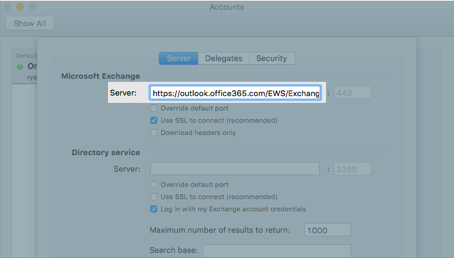 This article presents useful information and troubleshooting steps for connecting a Microsoft Exchange email Account to SalesforceIQ. Need help finding your Exchange account information? 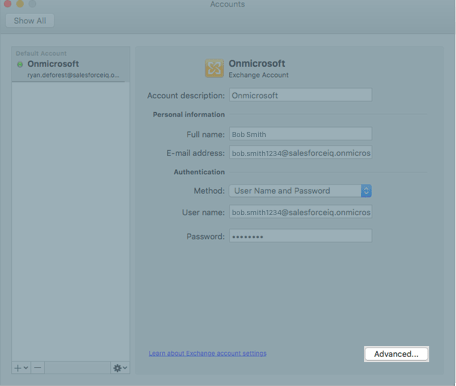 SalesforceIQ supports Microsoft Exchange 2010 and 2013, as well as Office365. If you are unsure which Exchange version your office uses, please ask your IT department. Exchange settings vary widely across organizations. Because of this, the information you need to connect depends on your organization. Even if you have a domain name and/or username, you should first try to sign up for SalesforceIQ without them. They might not be needed to connect to your Exchange account. Your domain could be an abbreviation such as nc. You may use a domain\username combination such as europe\myusername when logging in to your work computer, where europe is the domain and myusername is your username. 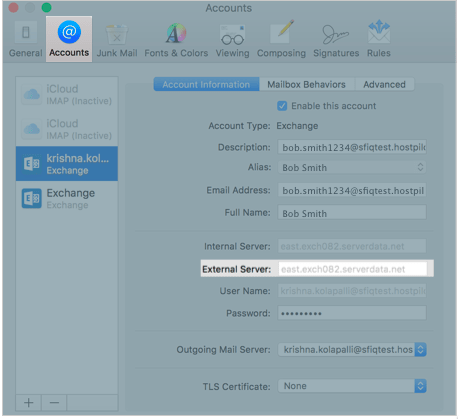 The address must begin with https:// and end in /ews/exchange.asmx. This address is not the link you use to access your email online. If the server name uses only letters and numbers in the form of an email address, use that text instead of the EWS server address. Note: If you use Outlook on Windows, click here. 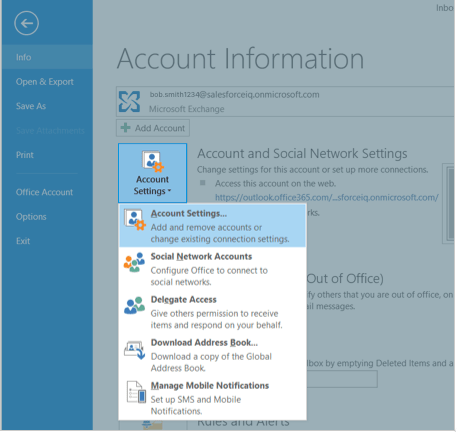 In Outlook, click the Outlook menu item and select Preferences. 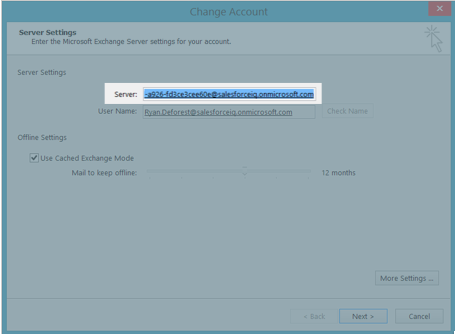 The Server field under Microsoft Exchange shows your Exchange server address. At the top of Apple Mail, click Mail and select Preferences. 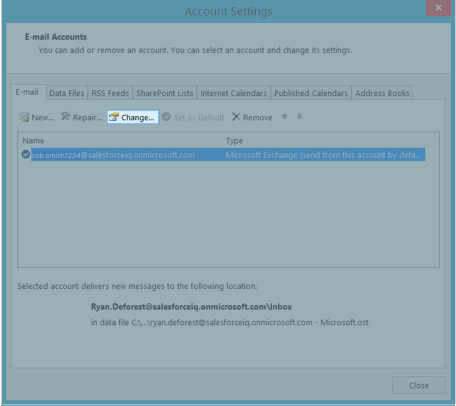 The External Server fields shows your Exchange server address. Enter this into the Server Address field on the left. Open Outlook and click File. Click Info, and then click Account Settings > Account Settings. Select the email account you want to connect to SalesforceIQ. Under Server Settings, the Server field shows your Exchange server address. Enter this into the Server Address field on the left. The most common way to find your domain and username is to enter the text that appears between @ and .com (or .org, .net, etc. ), followed by a backslash (\), followed by the text that appears before @. Do you have auto-discovery enabled? Do you need to allow self-signed certificates? 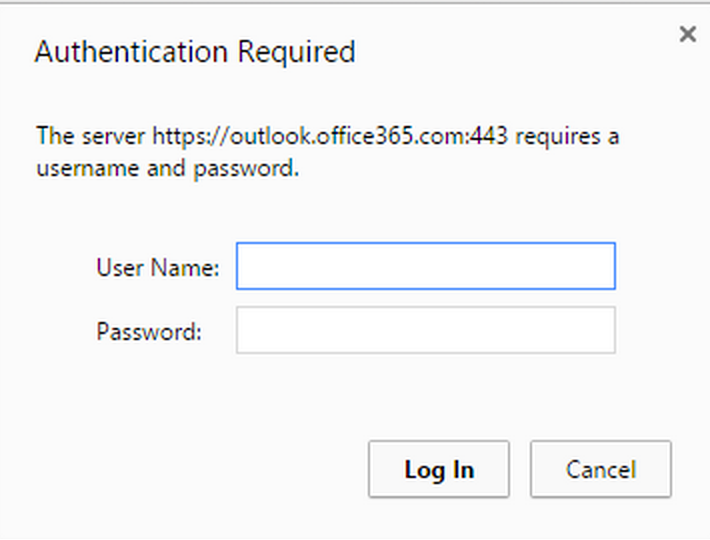 If so, click More Options, check the Trust unverified servers box, and try again. The following test is completely external to SalesforceIQ, ensuring that the information you provide is correct within your own organization. Note: An EWS server address is required for this test. Skip this test if you don't know your organization's EWS server address. Open a browser and enter the EWS server address into a browser. A screen similar to the following appears: Note: If an error appears instead, the EWS server address is incorrect. If an empty screen appears, either try again later (you may already be logged in), or try a different browser. Enter your username and password. 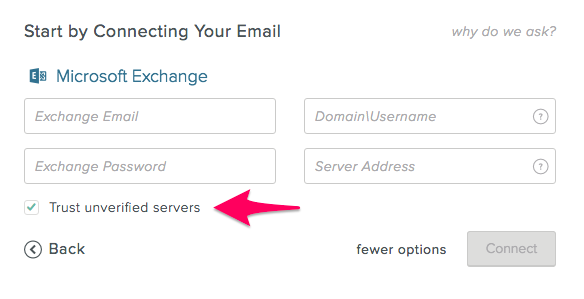 Your username is usually your Exchange email address, but could be your domain\username. You may need to try each separately. Click Log In. If successful, you will see output similar to one of the following, depending on your organization's Exchange version. If nothing happens or the login screen reappears, then some or all of your information is incorrect. Contact your IT department and try again.